I’m pleased to announce that my new book on Zabbix is now available on the market. 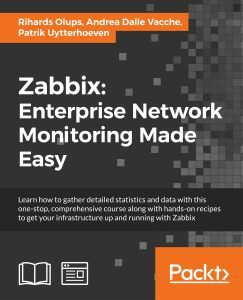 Packt has introduced a new course “Zabbix: Enterprise Network Monitoring Made Easy”. It is basically a blend of three published books of the same technology, intending to serve the customers with well-developed content. Among the three books chosen, your book has given us a great opportunity to create a learning path for our readers. The book has extremely rich content which deserves to be delivered to the customers, yet again in another way. The cookie settings on this website are set to "allow cookies" to give you the best browsing experience possible. If you continue to use this website without changing your cookie settings or you click "Accept" below then you are consenting to this. To know all the policy detais click here.